The story of the Mendi is rightfully being told after years of silence, but the full story is not yet in the public domain. 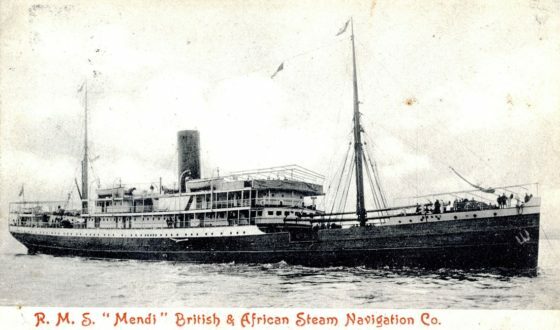 On 9 March 1917, the South African House of Assembly rose as a symbol of respect for the fallen troops in the SS Mendi, which sank on the 21st February 1917 with the loss of 616 South African lives. The House carried forth an unopposed motion to make a sincere expression of sympathy to the relatives of the deceased officers, non-commissioned officers and natives in their mourning. Clothier, N. Black Valour. Pietermaritzburg: University of Natal Press, 1987. While 616 South African Servicemen died in the incident, a further 30 lives were lost when the crew, who by all accounts were heroic in their attempts to save the ship and the passengers, also succumbed to drowning or being entombed in the ship. 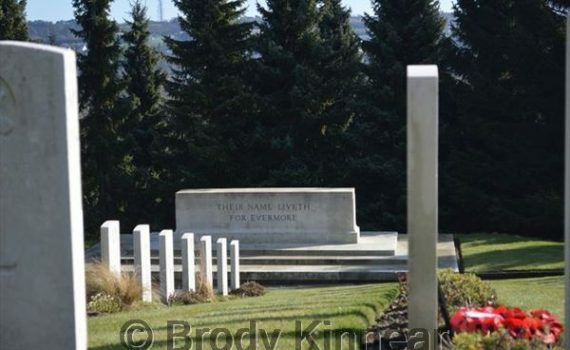 The Memorial at Holly Brook in Southampton and the graves at Milton in Portsmouth are well known, and thanks to the SA Legion’s European Branch and Andrew Bergman, those interred at Noordwijk Cemetery are also accorded recognition and honours. Less well known is the grave of Thomas Monamatunyu at Wimereux Cemetery in France, or the communal grave of Simon Linganiso, Jim Mbombiya and Smith Segule. Equally forgotten by most is the grave of Jabez Nguza in Hastings Cemetery, or the grave of Willie Tshabana in East Dean. On the 18th of February, the anniversary of the SAS President Kruger sinking, I commemorated the day and honoured those of my crewmates who were not as fortunate as I was to survive that sinking. However, I also decided it would be fitting to visit the lonely graves of those in the far flung cemeteries, so my family gathered the wreaths and set off. The grave of Jabez Nquza, Hasting Cemetery. What first struck us was that the grave of Jabez Nguza is not forgotten. A fresh posey of flowers was placed at the foot of the grave, and the site itself is stunning. 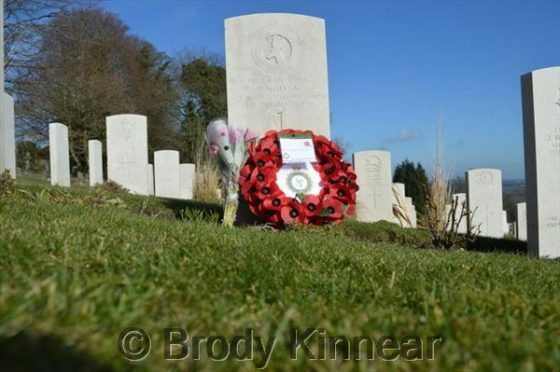 The Commonwealth Graves Commission’s work in remembering the Fallen is outstanding. We then placed a wreath at the cenotaph in honour of the SAS President Kruger and her crew, and acknowledged HMSAS Southern Floe. We set off for the village of East Dean, and found in a typical English Country churchyard a grave, slightly at an odd angle, alone on one side of the graveyard, but certainly not forgotten. 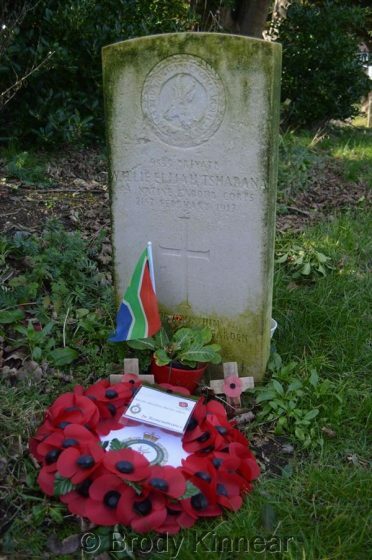 Flowers, two wooden crosses and a South African Flag were evidence that his grave was not forgotten. If you read many current accounts of the Mendi dead, you will probably not see this grave mentioned. We paid our respects, chatted to a local who promised he was in their thoughts, and she thanked us for being there. We then arrived at the village of Littlehampton, the site of the common grave of Simon Linganiso, Jim Mbombiya and Smith Segule. Once again we found signs that they were not forgotten, and we left Littlehampton infused with the knowledge that these men are appreciated and acknowledged by the communities they now find themselves. I also found flowers and tokens at other South African graves in those cemeteries. 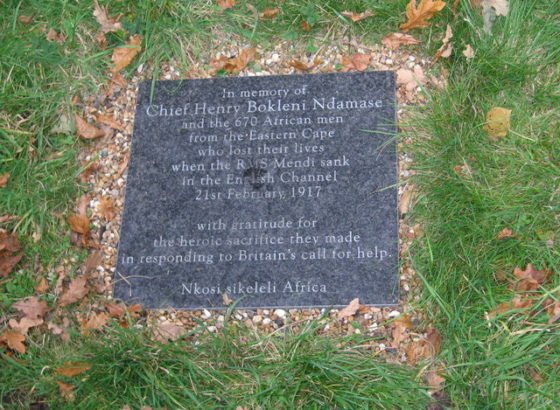 We also visited the church at Newtimber, where a memorial to “Chief Henry Bokleni Ndamase” is to be found. The origin of this plaque is a story for another day, as I have been invited to the church to hear the story. 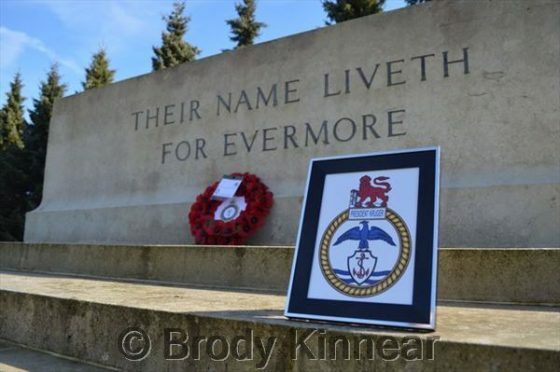 On the 24th February the SA Legion UK & Europe will gather at the Richmond Cenotaph with Legionnaires, friends, family and other veterans to commemorate the Three Ships at a formal service and parade. The SS Mendi is representative of the Naval dead of World War 1, and we commemorate HMSAS Southern Floe as representative of the naval dead of World War Two, as well as the SAS President Kruger, as the post-war representative.